Most people don’t happen to have a pair of skis stashed away in the corner of their college room. That's why we endeavour to get the best ski hire deals possible for our participants. 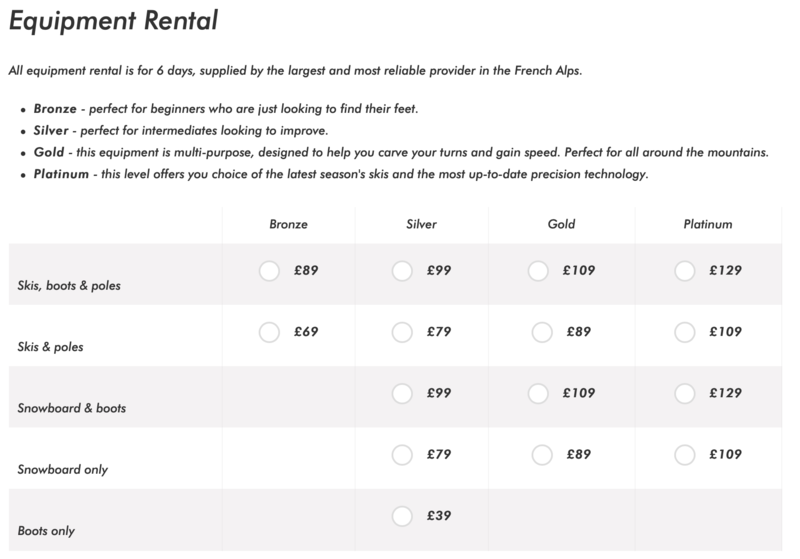 This year we’ll be offering four levels of ski hire: Bronze (£89), Silver (£99), Gold (£109) and Platinum (£129). For beginners, Bronze is more than sufficient, whilst those with more experience will be satisfied with the higher levels, still available at incredible value! Equipment hire is most commonly bought as a package including poles, boots, and skis (or snowboard). There is an option for just skis and poles if you own boots. Helmets can be hired for £16, something we would recommend to absolutely everyone, regardless of skiing ability. Good quality winter kit is necessary on the slopes. If you’re just starting out but don’t want to invest upfront, you may wish to rent to avoid any hassle. Easily available through the booking form, you can rent ski clothes, goggles, and specalist socks (which you get to keep! ), through our booking form. We've tried to make it as simple as possible - you just need to select your size. At the end of the week, simply hand back in the hired kit just before you leave.